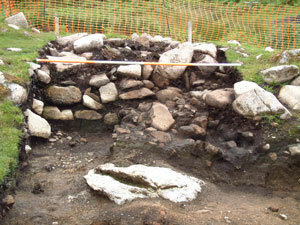 Excavations have progressed well at the High Pastures site despite some heavy rain and strong winds. Read on to find out what we have found in the trenches. Although a deep Atlantic low pressure system pushed in some very wet and windy weather during the middle part of the past week, work at the High Pastures site has progressed well. High water levels in the main stream passage of the cave has restricted work in Bone Passage, but we have been able to continue with our excavations in Trenches 2 and 5. The image above shows Trench 5, which is an extension of Trench 2, to investigate the wall of the U-shaped enclosure at the site (Scale=2m). Excavations have uncovered a low stone-built wall between two to three courses high, with deposits of fire-cracked stone that have built up against the wall face. The wall has also been covered by large quantities of granite stones and boulders at a later stage in its life, much of which has been affected by heat. A lens of quite sterile soil lies below the wall, indicating a possible abandonment horizon at the site, below which we found an area of micro-paving pressed into the natural sub-soil. The excavation of the trench, which has been undertaken primarily by Ann and Mike Kibby of Lower Breakish, has proved quite a task - uncovering the individual stones and removing a thick mat of bracken roots. 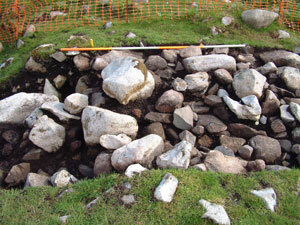 The image below shows the surface of Trench 5 from the south, with the mound of stone covering the wall. The trench has not produced much in the way of artefacts, but today a fragment of rotary quern was uncovered below some of the stones and boulders (see image below). The artefact is half of a top stone that has broken through the funnel-shaped hole where grain would have been introduced for grinding. 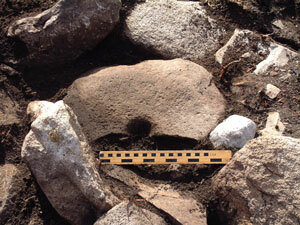 A similar quern fragment (also a part of a top stone) was recovered from the tumbled wall of the roundhouse on site in 2004, during the recording of the structure. This was manufactured from granite. The quern stone found today was manufactured from sandstone. The artefact will be recorded in situ and the stone removed from around it before lifting takes place. Excavation work in the Trench 2 extension is also going well (see image above - Scale=2m), which is removing the standing baulk between Trenches 2 and 3 (see plan of trenches below). The trench seems to have been placed quite by accident on a distinct boundary separating two very different archaeological deposits. To the east the deposits comprise structured lenses of fire-cracked stone and ash, which can be seen to great effect in Trench 2, while to the west (right in the image above) there appears to be quite a chaotic fill of brown soils and significant amounts of granite and limestone boulders. There is no apparent structure to the fill at this level, although we can see in the section with Trench 2 a number of overlapping granite slabs that may be structural. 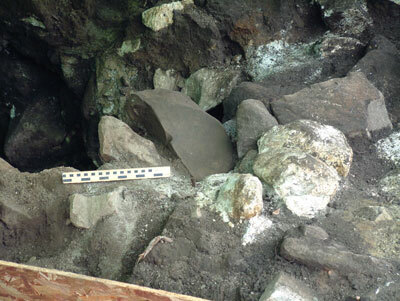 The area we are excavating here is situated very close to the former entrance to the cave, so the slabs may be the remains of corbelling associated with some type of man-made entrance into the natural cave beyond. We have to excavate through 4 to 5 metres depth of deposits here to get to the level of the cave passage below. The plan above shows the location of the various trenches at the High Pastures site in relation to the identified structures, which are shown shaded in the plan. 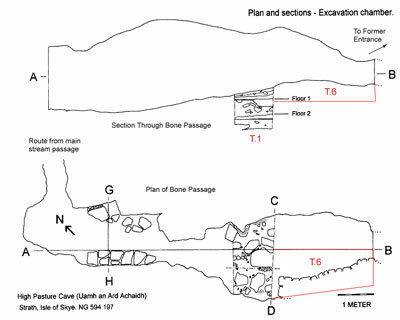 Trenches 1 and 6 are located in Bone Passage, a part of the cave system lying below the structures, which is also shown on the plan. One major objective of the excavations at High Pastures is to open the original entrance into the cave that was used by the prehistoric inhabitants of the area. This lies between the end of Trench 6 (Bone Passage) and Trench 2 extension. As we excavated through the chaotic fill of the Trench 2 extension Martin uncovered a small fragment of rotary quern stone. This was also a part of a top stone manufactured from a light-coloured sandstone. A small section of the polished underside of the stone was visible and the quern had fractured through the handle hole, by which the quern would have been rotated against the stationary base stone. Immediately below this artefact Martin uncovered yet another rotary quern fragment, this one comprising half of a top stone that had fractured through the funnel-shaped hole. This was also manufactured from sandstone and has a slightly convex polished grinding surface (see image below - Scale=0.25m). This was a wonderful find however, on removing this item another rotary quern fragment was found lying below. This was also found to be part of a top stone, manufactured from sandstone, that had also fractured through the funnel-shaped central hopper-hole. Unfortunately, the ground surface of the stone had delaminated. We also recovered two fragments of iron slag and a single sherd of pottery from the same area of the trench as the querns. Along with two fragments of rotary quern recovered from Trench 1, Bone Passage during 2004, we have now found 7 rotary quern fragments from the site to date. We have also found several saddle querns and quern fragments from Trench 2 during the past few months on site. This can be no accident of preservation or casual deposition. The three quern fragments found, all of which are top stones from three different querns, must have been placed within the fill. This must have been a special votive deposit, one of which is difficult to explain at the present time. 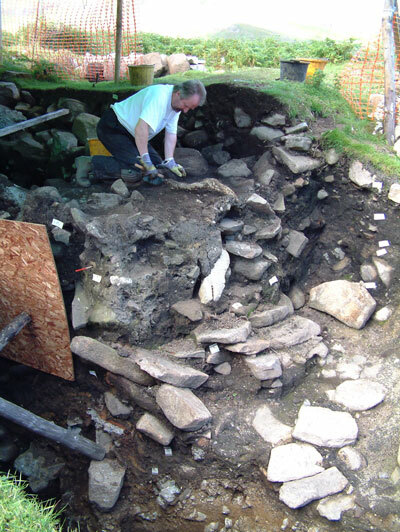 Several excavated souterrains in Scotland that had been deliberately backfilled in prehistory produced smashed rotary quern fragments, often placed in the destroyed entrance to the structure. But why place the items in these ‘special’ locations? Quern stones have been found associated with structured deposits in settlements and other places in the landscape, and with human burials (see Bradley, R. 2005 ‘Ritual and Domestic Life in Prehistoric Europe’, pp.107-8). The finding of quern stones in prehistoric cemeteries in European contexts does not necessarily mean that the stones were used to grind the ashes of the dead, but it is possible that there may have been some association between the agricultural cycle, death and regeneration. Whatever the case may be, we have a growing number of quern stones that have been deposited in sediments immediately above the former entrance into High Pasture Cave and it will be interesting to see what we find as we draw closer to this potential portal into the Iron Age Underworld, or Otherworld. Although the weather on site has been quite wet during the past couple of weeks, we have managed to carry out a little excavation work in Bone Passage. 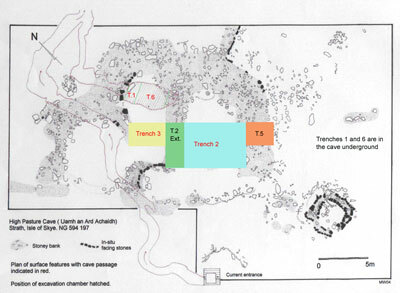 Here, we are excavating Trench 6, which is located immediately below and adjacent to the former entrance into the cave (see plan below). We are recovering a steady stream of finds from the rich archaeological deposits in the passage, which lie above the paved floor of granite cobbles identified in the cave during 2004. The deposits are rich in charcoal and fire-cracked stone, which bears comparisons with the deposits excavated in the lower contexts of Trench 2 on the surface. The sediments in the cave also contain fish bone, shellfish remains, charred plant remains (especially of barley), sherds of pottery, stone tools and bone and antler artefacts. The animal bone assemblage recovered from the cave also contains significant quantities of pig bone (early domesticates), that may have been utilised in feasting activities at the site. 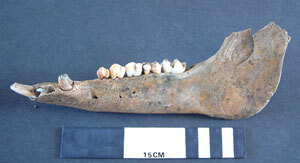 The image above shows the lower mandible of a pig, possibly between one and two years of age at death. At least 14 individual pigs have now been identified from the cave passage deposits by Carrie Drew at the University of Durham. The pigs have been butchered and divided in a specific manner, very different from the other animal bone deposits recovered from the site. 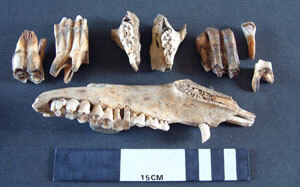 The image below shows other mandible fragments of pig, along with teeth from a variety of other types of animal including domesticated cattle and red deer. 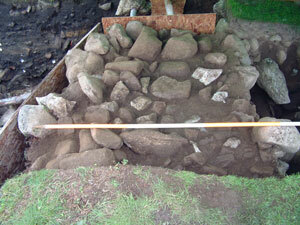 For more details and images of artefacts recovered from the site during the past few days see the (Latest Finds Page). Carrie is presently writing her dissertation on the animal bone assemblage from the High Pastures site and we look forward to her continued and important contribution to the project. Although we continue to receive a steady stream of visitors to the High Pastures site and an increasing number of hits to the website (now up to 24,000 hits), we will be holding a full week of Open Days at the site between the 5th and 12th October 2005. Visitors will be given guided tours of the excavations and will be able to view work in the cave passages below ground via CCTV cameras and monitors housed on the surface. There will also be opportunities for people to parcipitate in guided walks of the landscape surrounding the site with the Highland Council Rangers, assist with wet-seiving and sorting of archaeological deposits from the site, and there will be a display of some of the artefacts recovered so far. For the younger generation there will be a chance to excavate and make finds of their own in a trial trench, replicate the manufacture of bone and antler tools, grind barley in a saddle quern, and to grind iron ore using the same types of tools found at the site. Face painting will be available to provide that authentic Iron Age appearance! The site will be open daily during these dates between 10.00am and 5.00pm, so make a date in your diary now and visit the website for more updates soon. Hey up Steve ! looks like you’re having fun up there, a great website too. i’m currently working near Bangor where we’ve found a neo. house, burnt mounds, round houses and all sorts. Hope you are well. Regards, Rob. bracelet, (see Finds pages for that item). When we visited towards the end of August, part of an item made of jade (a bracelet) was reported to have been found. I may not be seeing it but I couldn’t find this here - and was interested to know if any more of it had been found? Sincere thanks to Messers Birch, Wildgoose and ? for a fascinating time spent at the Dig & Cave yesterday 1 September. A most memorable experience in every respect.